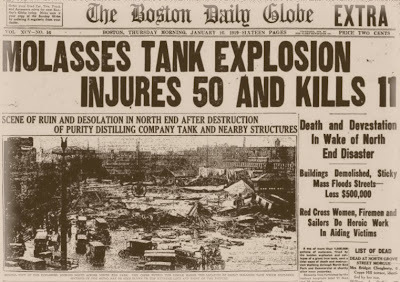 Historical Fiction: In Glass Jars - The Molasses Disaster Preview ~ The History Girl! Small repairs. Always the small repairs to disguise the flaws. Santo quit the Purity Distilling Company last week after his boss ignored his warning for the seventh time. More than two million gallons of molasses bubbled within the leaking tank. The tank was Santo’s responsibility and he knew it wouldn’t hold much longer. Still, Mr. Reid ordered welders and painters to patch and camouflage the creeping cracks. “The need for molasses is decreasing, the war being over. We can’t afford to build a new tank or make costly repairs. This tank’ll do just fine. You worry too much,” Mr. Reid told Santo. Santo slammed the door behind him before Mr. Reid could finish. It angered Santo’s wife when he first told her he had left the solid employment with Purity Distilling. Now at least, he thought, they could both sleep in peace without his guilty nightmares, his thrashing and screaming in the night. But the dreams continued. Nat Haggerty sat on a high stool at the counter of his favorite pub, Sally’s. Looking through the distorted glass of the window, he watched the tank erupt. Massive. The same color as the frothy ale gripped in his right hand. As much as he’d feared this and pictured the tank collapsing, he never imagined that the thick molasses could engulf the harbor within seconds. The glass fell from his hand and shattered. An omen come too late. “Run!” Nat shouted. He scrambled out of the bar to the firehouse next door then charged up the stairs two at a time. All through the North End the willowy tenements quaked and imploded. Above Commercial Street the elevated railroad trestle groaned, its spine bent at an impossible angle. A wall of molasses crashed through the windows at him. Nat yelled to Seamus and John, “Run boys! 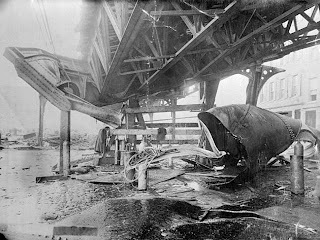 The molasses tank’s exploded.” Pipes burst, drenching his uniform. The floor shook beneath his boots. Then without warning, it caved. Eleanor fluffed a pillow and placed it on the newly made bed. The scents of lavender and fresh linen floated through her son’s room. They had lived in this house for twenty one years and now Italian immigrants, who never even attempted to speak English, dominated the neighborhood. When Peter first told her they were moving she couldn’t help herself, “Thank the Lord,” she said, raising her head and palms to the sky. Peter had simply shaken his head. Peter worked in the shipyard, not far from home, and he would be arriving for lunch any minute. During the day, he worked with the Italian men his mother so loathed. Side by side, they strained every muscle lifting and carrying and pushing and pulling all through the day, finishing just after their bodies revolted against them. Peter dabbed at the cold sweat on his neck and forehead, stretched his shoulders, and started heading to his house. His stomach rumbled like the choppy sea that was always at his back. Maybe his mother had made egg salad sandwiches. He could really go for a few of those right now. He needed energy, and there wouldn’t be time for a nap after the docks, before he went to tend bar at Sally’s. Sure, he was hungry and beat, but his strenuous work and frugality had finally bought his dream home, away from the noisy, filthy tracks. He’d be there by next week. Peter entered the house and tuned the radio until he heard his favorite Sox player, Babe Ruth, talking about his homerun record. Eleanor poured him a glass of milk, warmed the way he liked it, especially during the frigid days of a Boston January. He bit into his sandwich. Liver. But it would do. He slugged his milk as if it was two fingers of whiskey. All the while, he was conscious of the cracked little clock on the counter—but what drowned out its ticking? The walls began to groan and shake. The clock fell from the counter, smashing to bits on the hardwood floor. Peter turned and saw the viscous amber flood swallow his mother through the now pulverized bay window and into its vast belly. Abigail Hammond lives in Boston and is a graduate of the Fairfield University Master of Fine Arts program in Creative Writing. Her short stories, “Another for the Masses” and “A Lunar Holiday” have appeared in the literary journals The View From Here and Red Ochre Lit. Additionally, she has written for www.geekeccentric.com.